“Because we’re the world’s largest retailer of replacement keyless remotes, we’ve seen literally millions of remotes cross our path. We took the best of all those designs and created what has proven to be a superior product compared to OEM factory remotes. In addition, we conducted long-term durability testing which confirmed our design is far more durable than anything out there,” states Mark Lanwehr, founder of iKeyless.com. The iKeyless Universal Car Remote is customer programmable for 100% of the vehicles it’s compatible with. A comprehensive compatibility chart is available at www.universalcarremote.com. Setup is simple - similar to that of a universal television remote - with instructions written so the average car owner can program/pair the device on his or her own without assistance from a professional installer or technician. The instructions require no tools or specialized knowledge and the iKeyless support team is available 24/7 via the toll-free help line. In addition to being consumer friendly, Mark Lanwehr comments, “The Universal Car Remote is ideal for brick -and mortar auto parts retailers, locksmiths, independent garages, and hardware stores alike. It’s very retail friendly because it’s customer programmable and comes with detailed programming instructions. There’s no training needed for store employees.” The Universal Car Remote is also affordable. Retail customers will pay approximately one half what they’d pay at a local car dealership for model/make specific remotes. 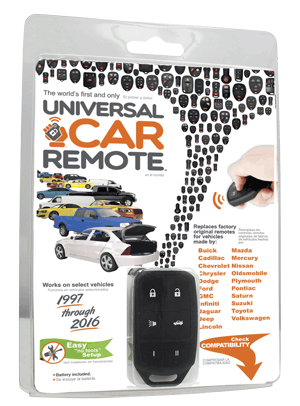 For more details regarding purchasing or selling the Universal Car Remote, please visit unversalcarremote.com or call (877) 445-3953. About iKeyless.com Established in 2002, iKeyless.com is an independently owned technology company headquartered in Louisville, KY. iKeyless is the world’s largest retailer of replacement keys and keyless entry remotes. iKeyless specializes in the design, manufacture, wholesale distribution, and retail sale of automotive keys and keyless entry remotes. Learn more about our products and services by visiting www.ikeyless.com.